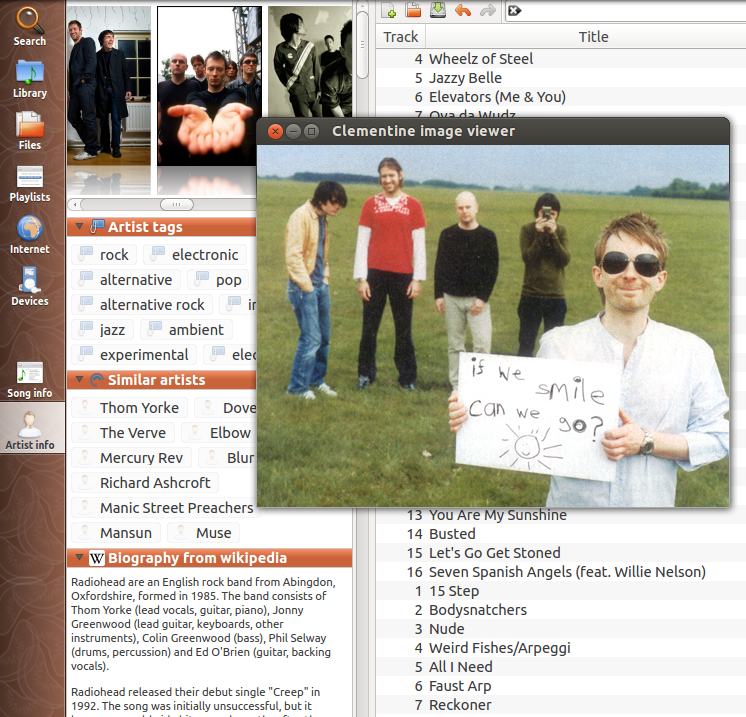 Why is Clementine my favourite music player? | goFLOSS! Everyone complains about how many different music players are available for Linux. Some people say that developers should join forces and make the best music player ever. But choice is amazing, competition is often stimulating, and defining the best one depends on what each user is looking for. I can safely say that I haven’t tested even a twentieth of the available full-featured music players. In the open-source world, I have tried Banshee, Rhythmbox, Amarok, Exaile, Audacious. In a different world, I also have used Winamp and – I dare say – iTunes and Windows Media Player (eeek). But I have been using Clementine for quite a long time, and I do not feel the need to look anywhere else anymore. Clementine started its life as an Amarok 1.4 fork, with a first release in February 2010, and at the time of writing, the player has reached version 1.2.2. Following an extremely trendy format, here is the list of main reasons why you should give it a go and be happy forever – according to moi. It is in no way ordered, so do not worry about those numbers! Something I have never seen anywhere else is a lovely fade-out when a song is stopped or when the player is closed. How sensible is that! Clementine’s fade-ins and fade-outs are highly customisable. You can get rid of all the “fades”, or you can make Clementine fade out when you pause a song, and chose how long for. You can even cross-fade between tracks for a smoother playlist. Of course, I wouldn’t even go for a closed source music player. The choice of open-source music players available doesn’t even let you justify looking anywhere else. 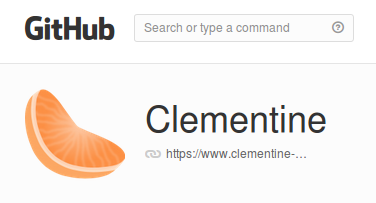 Clementine’s development is hosted on GitHub. So, if you use different operating systems on different machines, you can at least play music the same way. 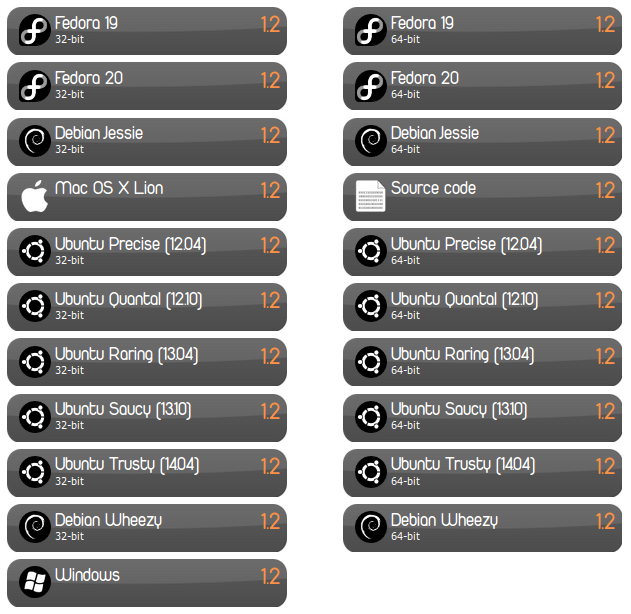 At least for Ubuntu, Clementine is very nicely integrated in the environment. An indicator is visible in the top panel, and changes depending on the state of the playback. A notification bubble appears when the track changes and gives you all the information you need. Clementine is also controllable from the sound menu, with the option to chose from your playlists straight away. And if this isn’t enough, you can also control it from the launcher with a simple right click. 5. The developers are cool! I don’t know about you, but this is the kind of things that make me believe in humans. To tell you the truth, I am not exactly sure what is heavy and what is not, but at about 60 mb of RAM, I feel like Clementine playing a song is not too much of a weight on my system, on par with Nautilus and way under Firefox, Thunderbird and Chrome. How does Clementine compare in memory usage? The download for an Ubuntu 13.10 64 bits system is just 7.2 mb at the time of writing. Clementine bundles more than 20 sources for music, from open license music website Jamendo to your music stored in your Dropbox or your Google Drive, as well as several radio station providers and streaming giants Spotify and Grooveshark. A few of those providers require that you own a premium account to use them, but there is enough choice to please everyone. Nota bene: following the news of Ubuntu One closing down in June 2014, the Ubuntu One provider has already been removed from master. You can also click on the Artist info tab to get to know lots about whoever you are playing, see photos, discover similar artists and read about their history. Wikipedia provides the biography by default, but if you scroll down, you will be able to chose from 9 other providers, including LastFM and Discogs. The Song info tab, on the other hand, gives you LastFM stats and the lyrics from three different providers. Clementine 1.2 Artist info tab. You can select a photo to have a closer look at it. MusicBrainz is one of my favourite open data project. It is a well-built database about music, so humans can read it like and encyclopaedia, and so robots can use it. 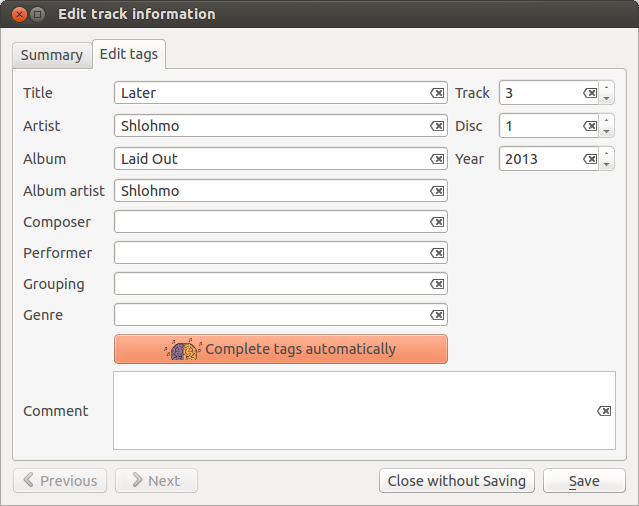 I am of course delighted to see that Clementine uses MusicBrainz for its tagging functionalities. It is now even easier to have your collection properly tagged, as you can let Clementine automatically look through MusicBrainz for you! One of the latest additions to Clementine is its ability to be controlled from your Android phone thanks to Clementine Remote. You can use your phone to browse your library, add songs to your playlist and change the volume, without having to go to your computer + stereo system. ♥ Give it a go! 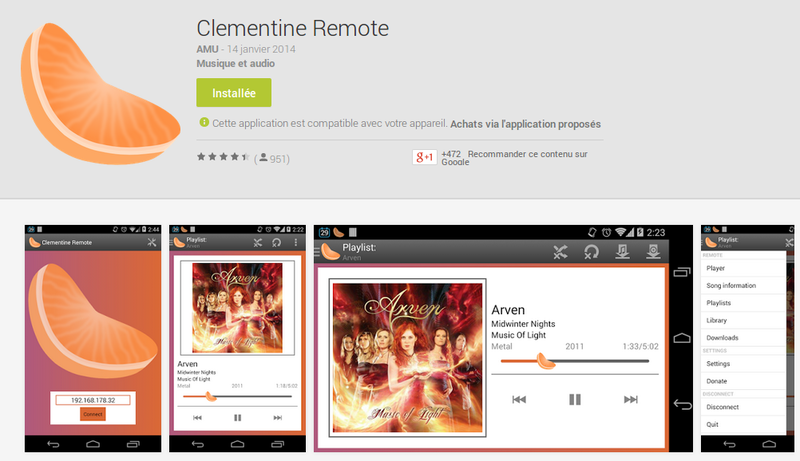 Head to the download page to try Clementine with your library, and see if it works for you. Still not convinced? Have a look at this AlternativeTo page to find other open-source alternatives – surely you will find your favourite! ← Happy Document Freedom Day 2014! It is possible to expand the list of music providers? It would be helpful if you could make a post helping people to import a file on Clementine containing a big list of broadcast statios, incluinding news providers. Thanks! The music sources are defined by the software version. If you go in Preferences > Internet services, you can tick and un-tick whichever you want to use or not, but what you see there are all the services that you can use with Clementine. How can I enable “Artist Info” ?? I downloaded version 1.3.1 but “Artist Info” is not working !! I have it installed on an iMac with Mac OSX 10.11.6 El Capitan. Hi Jan, sorry about the late reply!